and when he had given thanks, he broke it and said, “This is my body that is for you. The Church celebrates in her liturgy the Last Supper on Thursday of Holy Week, to recall the time Our Lord Jesus Christ gathered the Twelve Apostles during the Passover season. "The Lord Jesus on the night he was betrayed" (First Corinthians 11:23) initiated the Eucharistic Sacrifice of his body and his blood. The Institution of the Eucharist is forever marked by by the Lord's passion and death on the Cross. The actions and words of Our Lord at the Last Supper laid the foundation for the new messianic community, the People of the New Covenant in Christ. The Lord's Supper is prefigured in Hebrew Scripture, our Old Testament of the Bible. For example, Melchizedek, the King of Salem and priest of God Most High, brought out bread and wine to Abram (Genesis 14:18). Abraham was going to offer his beloved son Isaac on Mount Moriah until an angel stopped him, so he found a ram to sacrifice to the Lord (Genesis 22:1-19). The solemn Jewish Feast of Passover (Pesach in Hebrew) was instituted by God to commemorate the Exodus of the Israelites from Egypt (Exodus 12:1-30), where they had been slaves for 430 years before God rescued them. On the night of First Passover, Moses and the Israelites were instructed to sacrifice an unblemished year-old male lamb, and take hyssop and sprinkle the blood of the Passover Lamb on the lintel (overhead) and two doorposts. The Israelites in thanksgiving that evening were to eat the roasted lamb. The Lord would pass over the houses sprinkled with the blood of the lamb and not allow the Angel of Death to enter their homes when he struck the first-born in the land of Egypt. This day of Passover was to be a Memorial forever. The Feast of praise and thanksgiving to commemorate the occasion began after sunset with the Passover meal of the sacrificial lamb on the fourteenth day of the month of Nisan (spring), and on the fifteenth day began the seven days of the Feast of Unleavened Bread. During that time, the Israelites were to eat only unleavened bread, to recall the time when they had to leave Egypt so quickly they had no time to make leavened bread. After God led them across the Red Sea, he guided them by sending a pillar of cloud by day and a pillar of fire by night. God told Moses he would rain down bread from heaven to feed the Israelites (Exodus 16:4). Every morning the manna from heaven would be there for the Israelites to sustain them on their journey to the Promised Land. God established his Covenant with them through the Ten Commandments at Mount Sinai. 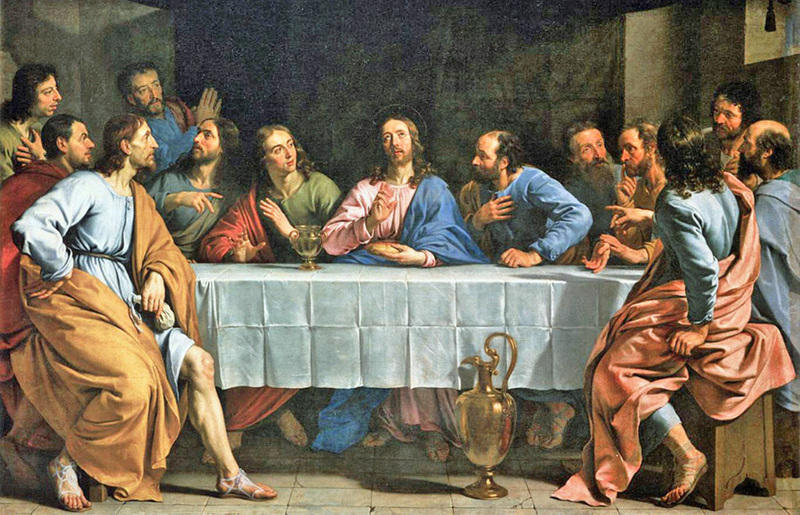 At the Last Supper, Jesus observed and fulfilled the Old Covenant and transformed the ritual into the New Covenant through the Institution of the Eucharist. Christ then offered himself in sacrifice once on the Cross (Hebrews 7:27). John 19:32-36 notes that the soldiers refrained from breaking the legs of Jesus following his crucifixion and so fulfilled Exodus 12:46 requiring that no bone of the Passover lamb be broken. Jesus became the Passover Lamb in the New Covenant! The Passover is fulfilled in the death and Resurrection of Christ. "For Christ our Paschal Lamb has been sacrificed." The above image notes the words Passover and Pascha in the Biblical languages. The word Passover refers to the Jewish Feast of Passover, the Passover sacrificial lamb, or the actual Passover meal. The word Pascha in Christianity signifies Easter Sunday, the feast day of the Resurrection of Our Lord. The Paschal Mystery of Christ refers to his Passion, Death, Resurrection, and Glorious Ascension, through which he accomplished our salvation. "This is my body, which is given for you. is the new covenant in my blood." The word Eucharist derives from the Greek word εὐχαριστία or Eucharistia which means Thanksgiving. The verb form εὐχαριστέω means I give thanks or offer a prayer of thanksgiving; the participle εὐχαριστήσας is translated "after giving thanks." The celebration of the Eucharist in the Church becomes a Memorial of the Last Supper and of Christ's one sacrifice on the Cross for the redemption of our sins. The Mass or Divine Liturgy is truly an act of thanksgiving and praise. After his Resurrection, Our Lord revealed himself to his disciples in the "breaking of bread" on the Road to Emmaus (Luke 24:30). The Apostles took to heart the words of Jesus to "Do this in memory of me" as an ordination to continue the New Covenant, as they celebrated the Real Presence of Christ in Communion through the breaking of bread (Acts 2:42). The Last Supper in a sense is the act of foundation of the Church, because Jesus gives himself and creates a new community, a community united in communion with himself. This community of the Lord at the Last Supper is what we experience today in the community of the Church. Today the Lord's Supper is celebrated in our Churches throughout the world. Our Church is essential today, for it serves as a refuge from loneliness and from human frailty and strife in our lives. Our community in the Church is a chance to become one with God through our Lord Jesus Christ. When we receive Communion, we become united to Our Lord and with our community, the Church. 1 Navarre Revised Standard Version of the Holy Bible. Four Courts Press, Dublin, Ireland, 1999-2005. 2 Pope John Paul II. On the Eucharist in its Relationship to the Church, The Encyclical Letter Ecclesia de Eucharistia. Pauline Books and Media, Boston, April 17, 2003. 3 Pope Benedict XVI. Jesus, the Apostles, and the Early Church. Ignatius Press, San Francisco, 2007. 4 The Catechism of the Catholic Church. Second Edition. Libreria Editrice Vaticana, 2000. 5 Scott Hahn. The Lamb's Supper: The Mass as Heaven on Earth. Doubleday, New York, 1999. 6 Brant Pitre. Jesus and the Jewish Roots of the Eucharist. Doubleday, New York, 2011. 7 Thomas O. Lambdin. Introduction to Biblical Hebrew. Prentice-Hall, Upper Saddle River, New Jersey, 1971. 8 Walter Bauer. Greek-English Lexicon of the New Testament, Second Edition (BAGD). University of Chicago Press, Chicago, 1979. 10 Ferrone R, Ryan T, Boyack K. Living the Eucharist. Paulist Evangelization Ministries, Washington, D. C., 2011.